Be inspired by our holiday inspiration, local events and activities with suggestions on how to fill the days by the coast. Escape for a moment, sit back, relax and take your mind to the Cornish coast with our 2019 Tariff. Enjoy a little me time with a wide range of relaxing and indulgent treatments at the Royal Duchy Hotel within our Retreat. The Royal Duchy Hotel is part of the Brend Hotels group, winner of 'Hotel Group of the Year' in the AA Hospitality Awards 2015-2016. We are delighted that these prestigious awards have recognised our warm welcome and passion for excellence. Brend Hotels is a family run company that has been a leader in West Country hospitality for over 50 years. Wake up on the Cornish Coast to a delicious hearty Cornish breakfast, before heading out on a walk across 4 local beaches. For top quality relaxed dining, we have an imaginative selection of light meals available in our Terrace Lounge Bar, which also benefits from glorious sweeping sea views. Or for a really special experience, you can choose to dine al fresco on our beautiful Sun Terrace. 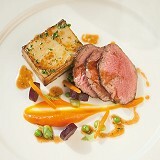 At the Royal Duchy Hotel we have a fabulous range of dining experiences to tempt you. Our award-winning AA Rosette Pendennis Restaurant brings you superb fine dining within a fantastic setting overlooking Falmouth Bay. You’ve set out for a bracing morning coastal walk, over flower-filled coast paths and strolled along one of four local beaches. Now it’s time for a scrumptious lunch and there’s nothing more delicious than tucking into a roast on the coast overlooking the bay. View our extensive drinks menu, including local Cornish wines, ciders and ales. View the Duchy cocktails served in the Champagne Bar. Please view this brochure for our Christmas Breaks! Take a look at our 2018 example. Download our brochure for our New Year breaks! Feast upon our specially selected Festive Christmas Eve Dinner, whilst singers Fascination Duo entertain throughout the evening. Bring in the New Year by the coast, indulge in a fantastic New Years Day Lunch with views over the bay, then blow the cobwebs away with a winter walk across of one of 4 local beaches. Celebrate in style this December, enjoy a superb festive dinner by the coast and dance until the early hours. Come together and celebrate Christmas by the coast with a delicious festive lunch in beautiful surroundings. Impress with our fabulous Valentine's dinner. A bespoke collection of dishes, carefully curated by Head Chef John Mijatovic, honouring the finest and freshest seasonal ingredients.